with the state dimension, and we fix (normal case). The application of the Pontryagin Maximum Principle (PMP) tells us that the minimizing trajectories are the projection of absolutely continuous extremals satisfying a.e. Definition 2 (Exponential mapping). For fixed and , we define in a neighborhood of (if possible), the following exponential mapping as the trajectory at time satisfying the Hamiltonian system for every in , with . where is the canonical q-projection, i.e. . The simple shooting method consists in finding a zero of the simple shooting function , i.e. in solving This is done by Newton type methods. A zero of the simple shooting function satisfies the necessary conditions of optimality given by the PMP. Remark 4. depends on , and we write the homotopic function (instead of shooting function) when we consider the parameter as an independent variable. With HamPath, it is possible to solve for in for instance, using differential path following methods. In this case, we say that is a homotopic parameter. If we note then the trajectory ceases to be optimal after the time if is a critical point of the mapping . In this case, we name a conjugate time and the associated conjugate point. Let give the following definition. is not of full rank . compute the Jacobi fields (definition 5) and check if there exists any conjugate points. 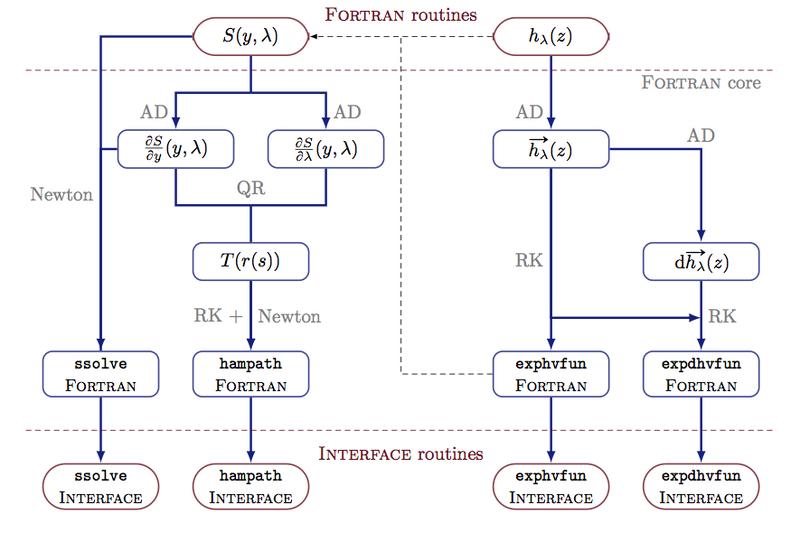 At the bottom of the following figure, the part below the doted lines is a fragment of the outputs of HamPath which is in the language chosen during the installation: it may be chosen among Fortran, Python, Matlab (only) or both Matlab and Octave. AD stands for Automatic Differentiation, RK for Runge-Kutta integrators used to solve ordinary differential equations, Newton for Newton-type methods to solve non-linear equations and QR for QR factorization.